Thursday night will see Burnley return to European competition for the first time since 1966/67. Many Clarets fans thought they would never see their club – who were trailblazers as only the third English team to play in the European Champions’ Cup in 1960 – back on the continent. Back in 1990, it looked pie in the sky – Burnley had just completed five years in the Fourth Division, after dropping down the leagues, and famously warded off relegation to the Conference on the final day of the season in 1987. Jimmy Mullen arrived as Frank Casper’s assistant, and, after taking over from Casper early in the 1991/92 season, helped pave Burnley’s way back to the top. Mullen guided the club to the Fourth Division title in 1992, and two years later Burnley were back in the second tier after a play-off victory over Stockport County at Wembley. 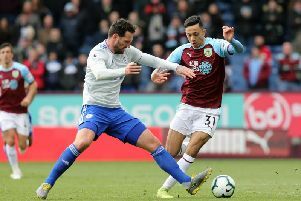 There was a bump in the road as the Clarets were relegated a year later, but Mullen is delighted to see his old club flourishing in the Premier League, and about to take on another former club Aberdeen in the Europa League. Mullen said: “I used to speak a lot with Brian Miller about Burnley’s days in Europe in the 1960s, and it’s fantastic they’re back there. “He said it was fantastic for the supporters, the club and the town. “Burnley isn’t the biggest of places, but for the size of the population, the crowds they get are brilliant. “Brian always spoke highly of the European nights, and the lads at Burnley and the manager – what a job he is doing, to be fair – will be looking forward to it. “Last season was a fantastic season for Burnley Football Club. “It’s hard to believe they are where they are, from where they were. “I’d like to think the two promotions we won helped the club on the road back. “A couple of years before I went there they could have gone out of the Football League, and financially you never know what could have happened. Mullen left the club in 1996, as Adrian Heath took over, initially as player manager, and he admits he would have done a few things differently, if he had his time again: “I look back now, and my only regret was not being strong enough to demand the things we needed to not just stay in the First Division, but do well there. “If I had my time again I would do it completely differently and demand certain things, certain players, and if it didn’t happen, maybe I would have had to look at something else, another challenge. “I wanted certain players, I didn’t just want to hang in there, I wanted to kick on. Burnley are certainly competitive now, at the top level, and Mullen is another of Sean Dyche’s legion of admirers: “Sean has done a remarkable job, even looking at some of the players he’s signed and sold on, the boy Keane...tremendous. “The players they’ve got now, I’m sure a lot of Premier League clubs would like to have them. “Tarkowski...tremendous, to get him for the money they did, and now look at him. “He was on the verge of going to the World Cup, and I think he’s a better defender than the centre backs that went to Russia. “People say now that defenders have to be comfortable on the ball, and I agree to a certain extent, but defenders have to defend, that’s their first job. “If you can play on top, that’s a bonus. But he can do both. Mullen – Midlands scout for Millwall for the last three years – was assistant manager at Aberdeen under Ian Porterfield from 1986-88, as they were tasked with taking over after the departure of Sir Alex Ferguson to Manchester United. The Dons went on to finish fourth twice in the Scottish Premier Division in that time, reaching the League Cup Final, losing to Rangers on penalties, as well as competing in the UEFA Cup. And Mullen remembers the European nights fondly: “It will be a great night on Thursday, it’s always a fantastic atmosphere at Pittodrie, for most games, but certainly on European nights. “Historically the club has done well, obviously winning the Cup Winners’ Cup in 1983, and they’ve had some memorable nights there. “Supporters and players love these nights, it’s a different environment playing in Europe, and even though this is an all-British tie, it is one to look forward to. “It is a change from the run of the mill of the league – although the Premier League is a great standard – but there’s a different feel altogether, there’s something about being in Europe gives everyone a lift. “We played Bohemians in 1987, and I scouted them in Dublin. “But when the game came around, they must have raised their levels five times over. “We drew 0-0 over there and just managed to beat them 1-0 at Aberdeen. “And then we played Feyenoord and went out on away goals. “They were flying in the Dutch League, but we went out on away goals – and they could be vital for Burnley. “Burnley could win the first leg 1-0, but that can be precarious if the opposition then score away from home in the second leg. “It makes it tough for teams.